REDBONE-ALREADY HERE, WOVOKA ANDD BEADED DREAMS THROUGH TURQUOISE EYES. When brothers Pat and Lolly Vegas decided to move to Los Angeles in 1969 to form a new band Redbone, they arrived with just a handful of change in their pocket. However, moving to Los Angeles was just too good an opportunity to turn down. Pat Vegas had recently won a singing contest run by Coca Cola, and the prize was a recording contract and the cost of travel to Los Angeles. This was the opportunity of a lifetime for the two brothers. Pat and Lolly Vegas weren’t newcomers to the music industry, and had spent much of the sixties trying to make a breakthrough. They released several singles, and the album Pat and Lolly Vegas At The Haunted House in the mid-sixties. However, commercial success continued to elude the brothers, and it looked as if their dream of becoming successful musicians was over. That was until Pat Vegas won the singing contest run by Coca Cola. Using the tickets provided by Coca Cola, Pat and Lolly Vegas travelled to Los Angeles, where they planned to form a new band. The band the Vegas brothers called Redbone, which is a Cajun term for a mixed race person. This was homage to the Vegas’ brothers mixed race roots which they were proud of. This would influence their music, when they formed their new band Redbone, which became one of the first Native American rock groups. The Vegas brothers started playing shows at various clubs on Hollywood and Sunset Boulevard in the evenings. During the day, the Vegas brothers wrote songs and practised. After a while, they became session musicians, and played alongside Elvis Presley, Little Richard, Tina Turner, James Brown and Sonny and Cher. This was good practise when the nascent lineup of Redbone signed to Epic. The other part of Pat Vegas’ prize for winning the singing contest was a recording with Epic. When the Vegas brothers were ready, they signed their recording contract with Epic. By then, Redbone’s lineup featured of bassist and vocalist Pat Vegas, Lolly Vegas, Peter DePoe and Robert Anthony. This was the lineup that featured on Redbone’s debut album. penned by Lolly Vegas. He also wrote Crazy Cajun Cakewalk Band and Niki Hokey with his brother Pat and Jim Ford, while the four members of Redbone wrote Jambone and Things Go Better. Pat Vegas wrote Danse Calinda and wrote Suite Mode with Peter DePoe and Tony Bellamy. These seventeen songs would feature on Redbone’s eponymous debut album. Redbone went into the studio with Pete Welding, who co-produced their eponymous debut album with Lolly Vegas. The four members of Redbone recorded a genre-melting album that veered between rock and R&B, to Cajun, blues, country and funk. Once Redbone’s ambitious, genre-sprawling album was completed, Redbone was released later in 1970. Redbone was well received by critics upon its release. This augured well for the release of the album. However, when the album was released, Redbone failed to chart. It was a disappointing start to Redbone’s career. Soon, though, their luck would change. After the disappointing sales of the eponymous debut album, it was a case of back to the drawing board for Redbone. They began work on their sophomore album Potlatch, which featured ten new songs. Five songs came from the pen of Lolly Vegas, while his brother Pat penned three songs. The Vegas brothers wrote Bad News Ain’t No News at All with Tony Bellamy and Without Reservation was credited to Redbone. These songs became Redbone’s sophomore album Potlatch. Just like Redbone, Potlatch was produced by Lolly Vegas and Pete Welding. Just like their debut album, the lead vocals were shared on Potlatch. Lolly and Pat Vegas took charge of the lead vocals, while Redbone became one on Bad News Ain’t No News At All. It was part of what was a much slicker and more accessible album than its predecessor. It found Redbone combining ballads like Alcatraz which was sung from the perspective of a Native American, with uptempo and funkier songs. Potlatch with its mixture of rock, R&B, funk and blues was another potent musical mixture. Critics were won over by Potlatch, and its much slicker, accessible style. So were record buyers when they heard the lead single Maggie. It reached forty-five on the US Billboard 100. Maybe Redbone’s luck was changing? That proved to be the case when Potlatch was released in October 1970, and reached ninety-nine on the US Billboard 200. Redbone’s music was starting to find a wider audience. Sales of Potlatch had been helped by Redbone’s recent appearance at the first Earth Day To The World in Philly. Redone was the opening act, and played Chant ‘13th’ Hour from Potlatch. After this appearance, record buyers started taking notice of Redbone. 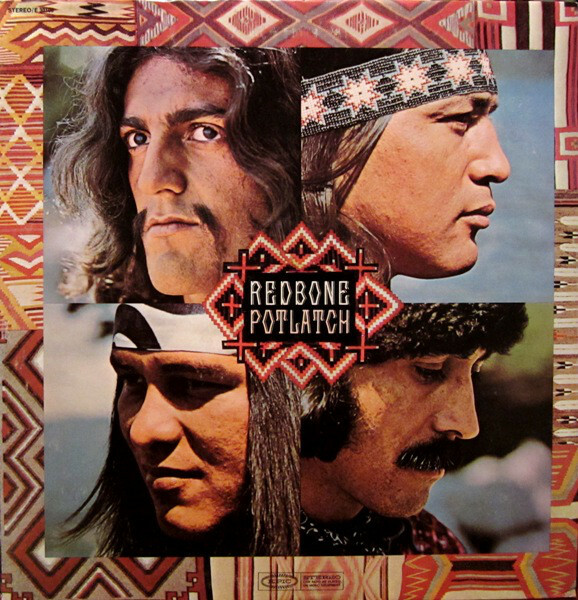 After the success of the single Maggie, and their sophomore album Potlatch, Redbone were keen to build on this success. They began writing and recorded their third album, which eventually became Message From A Drum. For Message From A Drum, Lolly Vegas wrote six of the eleven tracks and his brother Pat wrote the title-track. The brothers collaborated on Niji Trance, Jerico, The Witch Queen Of New Orleans and When You Got Trouble. These eleven songs from the pen of the Vegas’ brothers became Message From A Drum. When recording of Message From A Drum began, there was no sign of Pete Welding, who had co-produced Redone’s first two albums with Lolly Vegas. This time around, Lolly and Pat Vegas decided to co-produce another album that flitted between and combined musical genres. Elements of Cajun and Native American influenced were combined with rock ’n’ roll and blues. However, two of the instrumental were less than twenty-seconds long. They were an amuse-bouche for the rest of Message From A Drum. On hearing Message From A Drum, it received praise and plaudits from critics. 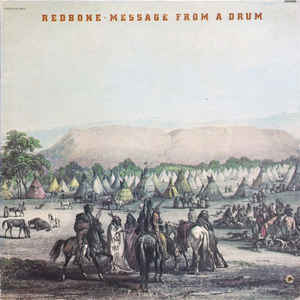 They hailed Message From A Drum Redbone’s finest album of their three album career. They weren’t alone. Record buyers agreed, when the single The Witch Queen Of New Orleans was released in 1971, it reached twenty-one on the US Billboard 100. This was the most successful single of Redbone’s career.It was a similar case with Message From A Drum, which was released in 1971 and reached seventy-five in the US Billboard 200. The album also found an audience in Europe, where it was released as The Witch Queen Of New Orleans. This included in Holland, where the album reached twenty-five. For Redbone, Message From A Drum was the most successful album of their career. Redbone had come a long way in just two years. They had released three albums, two of which had charted and enjoyed two hit singles. 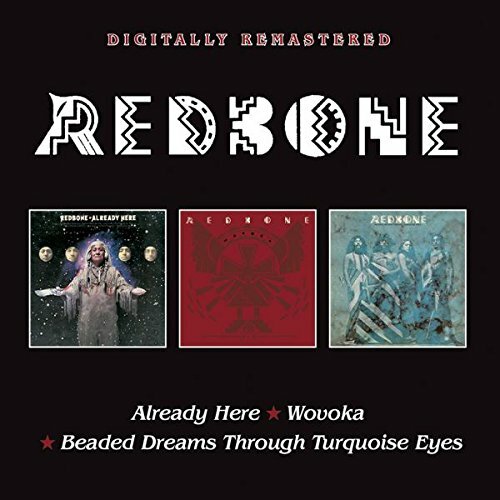 New chapters in Redbone’s career began with Already Here in 1972 Wovoka in 1973 and 1974 Beaded Dreams Through Turquoise Eyes, which have been remastered and rereleased as a two CD set by BGO Records. They document the next part in the story of Redbone. Before work began on Already Here, Peter DePoe was considering his position with Redbone. He had played an important part in the band’s sound, pioneering the thunderous King Kong style of drumming. It was a feature of the band’s sound, and powered the arrangements along. However, Peter DePoe was coming to the conclusion that his time with Redbone was over. He was about to make a huge decision, and maybe one he would regret for the rest of his life. By 1972, Peter DePoe had watched as the Vegas’ brothers took charge of songwriting and production. This most musicians knew, was where the money was to be made. As a result, Peter DePoe and Tony Bellamy were reduced to sidemen. While Tony Bellamy was willing to accept this, Peter DePoe decided to leave Redbone. Fortunately, Tony Bellamy knew of someone who could replace Peter DePoe, Arturo Perez who was also a drummer and percussionist. He auditioned and joined Redbone as work began on Already Here. For Already Here, Lolly Vegas wrote Speakeasy, Where Is Your Heart and Already Here, while Pat Vegas wrote Good Enough For Jesus. Lolly and Pat Vegas wrote Fais-Do and penned Motivation and Condition Your Condition with Tony Bellamy. The other song on Already Here, was a cover Leiber and Stoller’s Poison Ivy. These eleven songs became Already Here. When recording of Already Here began, the Vegas brothers were co-producing the album with Alex Kazanegras. This was the first time they had worked together. Redbone also drafted in various musicians to play on a track. This ranged from the Elijah Horn Section on Motivation to steel-guitarist Red Rhode, slide guitarist Terry Furlong, pianist Gordon DeWitty plus percussionists Chipper Lavergne and Ronnie Baron. They were joined by Davide Oliver and Michael Freda who added backing vocals on Condition Your Condition. The other musician who played a part in the making of Already Here was Condition Your Condition was drummer Peter DePoe, who made his Redbone farewell on Power (Prelude To A Means). It was the end of an era, and the start of a new one. Critics realised this when they heard Already Here. The addition of horns and lush strings was a new departure. This was a first for Redbone. So was their decision to move in the direction of country music. Redbone were musical chameleons, who constantly sought to reinvent their music. They continued to do on Already Here, where they continued to combine rock, R&B, blues and country. Essentially Already Here was a mixture Redbone’s musical roots and music that influenced and inspired the musical chameleons. Despite the quality of music on Already Here, the album failed to replicate the success of Potlatch and Message From A Drum. Already Here failed to chart, and was the one that got away for Redbone. Maybe this was a wakeup call for the band? When work began on Redbone’s fifth album, there was another change in the band’s lineup. The most recent addition, drummer and percussionist Arturo Perez had left the band. This was a huge blow for the band. However, Tony Bellamy introduced the Vegas brothers to his cousin Arturo Perez. He was a drummer and percussionist, and after an audition joined Redbone. This was perfect timing. For Wovoka nine were written for what would be Redbone’s fifth album. This included the Lolly Vegas’ compositions Sweet Lady Of Love, Liquid Truth and Come and Get Your Love. The Vegas brothers wrote We Were All Wounded At Wounded Knee. Pat Vegas had contributed Chant Wovoka penned Someday (A Good Song) and Day to Day Life with Tony Bellamy. Closing Wovoka was ‘23rd’ and Mad which had been written by Pat Vegas and former Redbone drummer Pete DePoe. Just like Already Here, Wovoka was co-produced by Pat Vegas, Lolly Vegas and Alex Kazanegras. Joining Redbone were Joe Sample on piano and vibes, percussionist Eddie Caciedo and backing vocalists Sherry Williams and Johnny Lopez. They played their part in another genre-melting album. 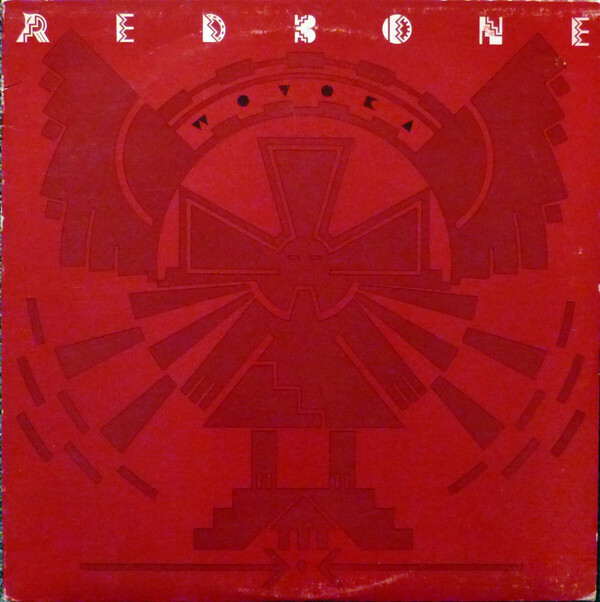 Elements of rock, R&B, folk-rock and pop were combined by Redbone on what was an accomplished, slick and sometimes, politically charged and controversial album. The controversy began when executives at Epic heard We Were All Wounded At Wounded Knee. It recalled the massacre of Lakota Sioux Indians by the 7th Cavalry Regiment in 1890. As the executives as Epic listened to the song, they knew there was a problem. Especially when the songs closes with the line: “we were all wounded ‘by’ Wounded Knee”. Straight away, the executives at Epic realised that this was too controversial a subject. So much so, the American and Canadian versions of Wovoka omitted We Were All Wounded At Wounded Knee. While this could be seen an act of censorship, executives at Epic were being realistic, as they knew the effect that a song like We Were All Wounded At Wounded Knee could have. Before that, critics had their say on Wovoka, and hailed it one of Redbone’s finest albums. One of the songs that stood out was the Lolly Vegas composition Come and Get Your Love. Come and Get Your Love was released as the lead single from Wovoka, and reached number five on the US Billboard 100 and seventy-five on the US R&B charts. The success of Come and Get Your Love resulted in Redbone’s first gold disc. This augured well for the release of Wovoka. When Wovoka was released in November 1973, it reached number sixty-six in the US Billboard 200, which was the highest chart placing of any of Redbone’s first five albums. Redbone released Wovoka as their next single and it stopped just short of the US Billboard 100 at 101. This was a disappointment for the members of Redbone. Everything had been going so well. For their next single, Redbone decided to release We Were All Wounded At Wounded Knee. When it was released as a single in America, it was promptly banned by several radio stations. Redbone had been the victim of a blatant act of censorship. It was a different matter when We Were All Wounded At Wounded Knee was released as a single in Europe. The single enjoyed a degree of success, and in Holland, reached number one. For Redbone, this was their first ever number one single and Wovoka had been their most successful album. This was a lot to live up to. Beaded Dreams Through Turquoise Eyes. Buoyed by their most successful album, their first gold disc and first number one single, Redbone began work on their sixth album Beaded Dreams Through Turquoise Eyes. It featured the same lineup of Redbone that recorded Wovoka. This time around, the Vegas brothers wrote the songs that became Beaded Dreams Through Turquoise Eyes. Lolly Vegas penned One More Time, Suzi Girl, Cookin’ With D’Redbone, Beautiful Illusion and Moon When Four Eclipse. Pat Vegas contributed Blood Sweat and Tears, (Beaded Dreams Through) Turquoise Eyes and Interstate Highway 101. The Vegas brothers wrote Only You and Rock and Roll and I’ll Never Stop Loving You. These song would become their much-anticipated sixth album Beaded Dreams Through Turquoise Eyes. Despite forging a successful partnership with Alex Kazanegras on Already Here and Wovoka, the Lolly and Pat Vegas decided to produce Beaded Dreams Through Turquoise Eyes themselves. They produced what was Redbone’s most commercial and accessible album at Devonshire Studios, North Hollywood and Wally Heider’s studio in Hollywood. Unlike many bands, Redbone and the Vegas brothers who produced Beaded Dreams Through Turquoise Eyes had no qualms about producing a commercial album that flitted between rock, blue-eyed soul, funk and R&B. Redbone hoped that the album would build on the success of Wovoka. While Beaded Dreams Through Turquoise Eyes was well received by critics, this carefully crafted, slick and accessible album passed most record buyers by. That was despite songs of the quality of One More Time, Suzi Girl, Beautiful Illusion and I’ll Never Stop Loving You. When Beaded Dreams Through Turquoise Eyes was released in 1974, the album stalled at 174 in the US Billboard charts. For Redbone, this was a huge disappointment. Just as it looked as if Redbone were about to make a breakthrough, and become one of the leading lights of American AOR, Beaded Dreams Through Turquoise Eyes had stalled in the lower reaches of the US Billboard 200. No longer did it look as if Redbone would be joining Styx, REO Speedwagon, Chicago and Foreigner at AOR’s top table. For Redbone, it was a case of close, but no cigar. 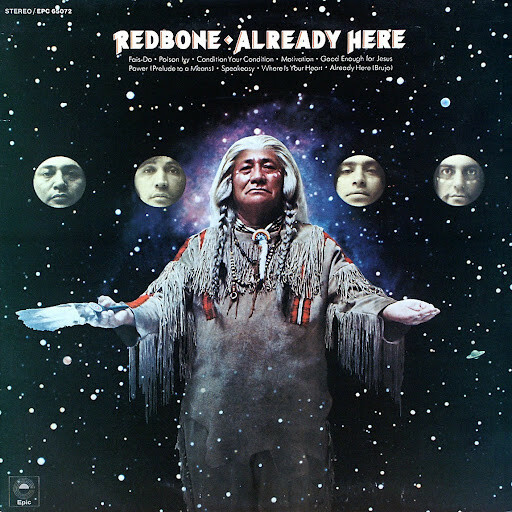 After the release of Beaded Dreams Through Turquoise Eyes, Redbone parted company with Epic after six albums, including Already Here, Wovoka and Beaded Dreams Through Turquoise Eyes which were recently remastered and rereleased by BGO Records. Redbone had spent five years at Epic and released six albums. During that period, four of Redbone’s albums had charted and they enjoyed three hit singles. Their biggest hit single in America was Come and Get Your Love, which sold over 500,000 copies and was certified gold. However, in Holland their most controversial single We Were All Wounded At Wounded Knee reached number one. 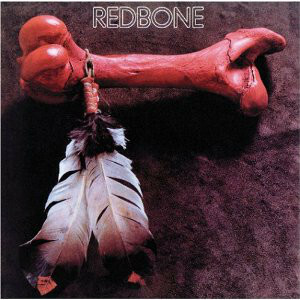 Holland and other parts of Europe, had been a happy hunting ground for Redbone. They proved a popular band during the Epic years. Three years passed before Redbone returned with their seventh studio album, Cycles in 1977. By then, disco’s popularity was on the rise, and Redbone’s music was no longer as popular. Cycles failed to find an audience, and that was the last studio album they released for twenty-eight years. 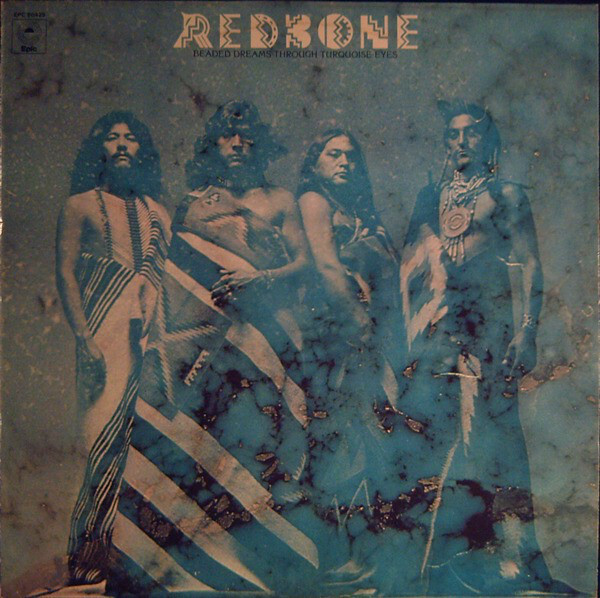 Redbone returned in 2005 with One World, which was later edited and re-titled as Peace Pipe in 2009. However, Redbone’s finest music was recorded during the Epic years, when the musical chameleons constantly sought to reinvent their music and move in new directions. That is the case on Already Here, Wovoka and Beaded Dreams Through Turquoise Eyes which features some of the best music that Redbone recorded during their Epic years. Redbone-Already Here, Wovoka and Beaded Dreams Through Turquoise Eyes.